This BJP Rally was a wrongly featured image of a video uploaded on Youtube by a Beniwal Supporter. Barmer (Rajasthan): Independent MLA Hanuman Beniwal has attacked Prime Minister Narendra Modi while announcing that Rajasthan needed a new political party to provide an alternative to both the BJP and the Congress. Hanuman Beniwal made the announcement at a huge rally of farmers in Barmer on Sunday. He said the youths had seen through both the major political outfits and “their false promises” and were looking for a change. Beniwal asked people to refrain from getting lured by promises he said Modi would make at Pachpadra while laying the foundation stone of the Barmer Refinery. Often we see this kind of scene in a cricket match. 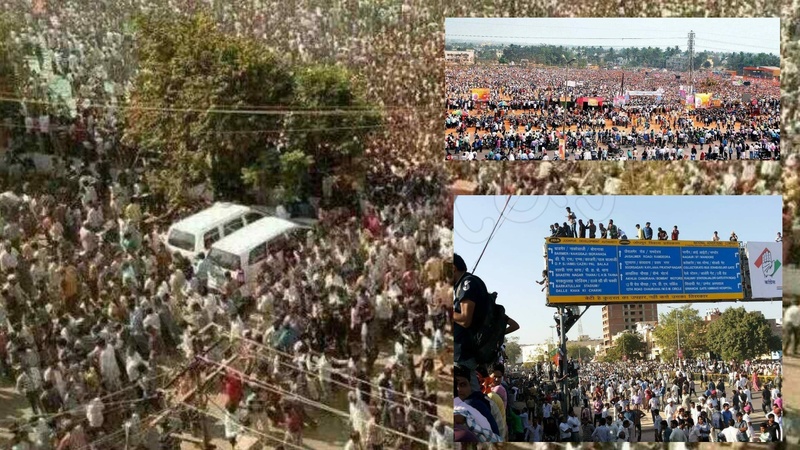 But this pic is taken at Narendra Modi's Jodhpur rally.Its not 'Aandhi' its NaMo Tsunami in the country. A quote that wasn’t spoken while few others were ! Did Durga Vahini lady defeat a Pakistani woman wrestler ? ← Randeep Surjewala targets Vasundhra Raje based on a trimmed clip. Hasn’t there been any MoU of Bullet Train signed at all ? Did RTI expose it ? Was Dr. Kalam humiliated by Journalists Barkha and Rajdeep ? February 26, 2019 Hoax Slayer Comments Off on A simulation game video is viral as #IAF’s yesterday attack on Pakistan.